Author(s): Sevgi Gezici, Department of Biology, Faculty of Art and Science, University of Gaziantep, 27310 Gaziantep,, Turkey	Mehmet Ozaslan, Gurler Akpinar, Murat Kasap, Maruf Sanli, Levent Elbeyli. Background: Lung cancer is one of the most common causes of cancer-related mortality, and its incidence is increasing steadily worldwide. NSCLC represents approximately 83% of lung cancer cases, including different subtypes, among clinically histological lung cancer types. 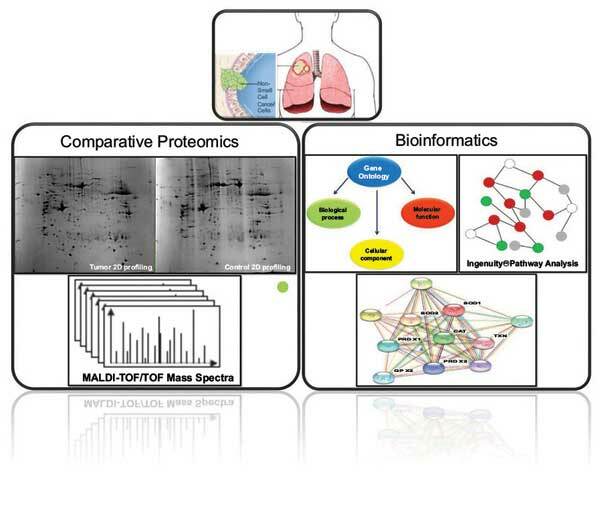 Materials and Methods: In this study, we aimed to identify proteome level differences between NSCLC tumor and tumor-adjacent non-tumor tissue samples using gel-based comparative proteomics. Additionally, proteins were classified using PANTHER, protein-protein interactions were mapped by STRING, and also, the top canonical pathway was identified using IPA network system. Western blot was used for validation the proteomics findings. Results: A total of 40 protein spots were successfully identified by MALDI-TOF/TOF, and 33 proteins were found differentially expressed, of which 27 proteins were up-regulated, whereas, 6 proteins were down-regulated in NSCLC tumor tissues. Conclusion: These findings show that proteome level differences between NSCLC tumor and nontumor tissue samples. Keywords: 2DE, bioinformatics, comparative proteomics, mass spectrometry, non-small cell lung cancer. Keywords:2DE, bioinformatics, comparative proteomics, mass spectrometry, non-small cell lung cancer. Abstract:Background: Lung cancer is one of the most common causes of cancer-related mortality, and its incidence is increasing steadily worldwide. NSCLC represents approximately 83% of lung cancer cases, including different subtypes, among clinically histological lung cancer types.